GMC CHEVY DURAMAX INJECTORS -- Best Injectors for GMC Chevy Duramax Diesel Pickup Trucks! DIESEL INJECTORS GMC Chevy Duramax Injectors 6.6L LB7, LLY, LBZ, LMM, LML! GMC 6.6L Chevy Duramax LBZ 2001-2004 Injectors: Stock Plus Injectors, DragonFly 50HP 23.5 LPM 15% injectors, 100hp Race 1 25 LPM 20% Performance Injectors: New Factory Built Bosch Stock Injectors New Factory Built Bosch Injectors built to Performance by Industrial Injection! Black Cloud Diesel has GMC Duramax Injectors -New Factory Built Bosch Stock Injectors New Factory Built Bosch Injectors built to Performance by Industrial Injection! Remanufactured Injectors are built with All New Parts. *Industrial Injection Remanufactured Injectors are rebuilt with all new Bosch parts. 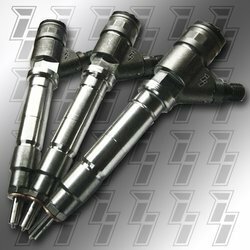 GMC Chevy Duramax injectors from Industrial Injection, specialists in the Diesel Performance industry! All of these Remanufactured Injectors are built with ALL NEW BOSCH PARTS by Industrial Injection. Get the perfect injectors for your GMC Chevy Duramax Diesel at a great price!